Few foods around the world have reached “icon” status quite like the burger. So during May’s National Hamburger Month, let’s rejoice. We have 31 days of burger bliss. Time enough for a fine sampling, but as we all know, the burger offer endless possibilities. Why so many? Maybe, just maybe, we’re all searching for our very own perfect sandwich. You can tell a lot about a person by their burger choices. The bun. The patty. The cheese. The sauce. The sides. It’s all in there somewhere. But enough food philosophy — let’s get cooking. One month goes by quickly. Deconstructing the burger is making us hungry. It’s time to bring the sizzle. Burgers literally grew in size as various chains competed with each other. The result? Burger King's Whopper and the McDonald's Quarter Pounder. The hamburger patty machine came into existence — adding uniformity to every patty and helping in mass production. Chef and entrepreneur Walter "Walt" Anderson opened a hamburger stand in Kansas. Success! This would eventually lead to the White Castle chain. Fletcher Davis of Athens, Texas, perhaps invented the hamburger, serving a beef patty between two slices of bread. However this fact, much like everything else about the invention of the burger, is up for debate. Flip some burgers for your family and friends. It's an American tradition and May has the perfect weather for it. Go ahead and explore. Angus, chili, Buffalo, California, and vegan. And we're only just getting started. If you can think it, you can cook it. Fascinating facts, stories, theories, blogs, and posts. Everyone has an opinion (and lots of pictures) about America's favorite food. 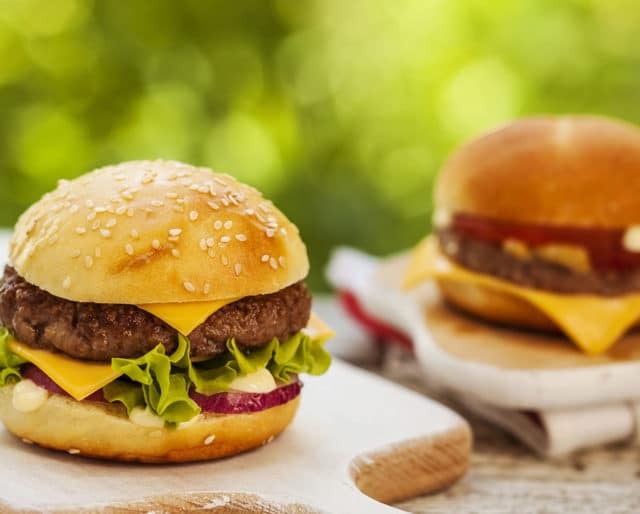 The modern-day burger evolved from steaks on a plate — a dish German immigrants brought to this country — consisting of a fried beef patty and served with onions, potatoes, and gravy. But no bun. Americans alone eat 50 billion burgers a year. That means an average American eats a hamburger three times a week! Mallie's Sports Bar and Grill, in Michigan, sells the world's largest, commercially available hamburger — weighing approximately 338.6 pounds. The FleurBurger, served at the Fleur in Las Vegas (Mandalay Bay), is made with Kobe beef and topped with foie gras and black truffles. Accompanied by a 1990 bottle of Chateau Petrus, it costs $5,000. McDonald's sells 75 hamburgers per second. Let's get all red, white, and blue patriotic about America's delicious sandwich — by way of Hamburg, Germany, of course. We eat hamburgers more than any other food. We know what you're thinking: What about pizza? Actually, it doesn't even come in a close second. A burger. Some fries. A soft drink. The ultimate. We seem to love our burgers pretty much anywhere and anytime.